To stop this dialog continually popping up, click the down arrow beside the Don't Save button, and then select Never Save. This will stop the dialog appearing again. After making any changes, you can choose to SAVE or CANCEL, or you can choose to DELETE the creek segment completely. Be sure to click SAVE after making any changes to the creek segment. You can complete the form and click SAVE. You can click CANCEL to close the form without saving it (note that the creek segment you created has already been saved and will not be deleted when you cancel). You can click DELETE to delete both the form and the creek segment. To create a new segment you will need to select the add button (the PLUS sign) at the bottom right to expose the Add Creek button again. Now click on a Landcare Boundary and it will change colour. 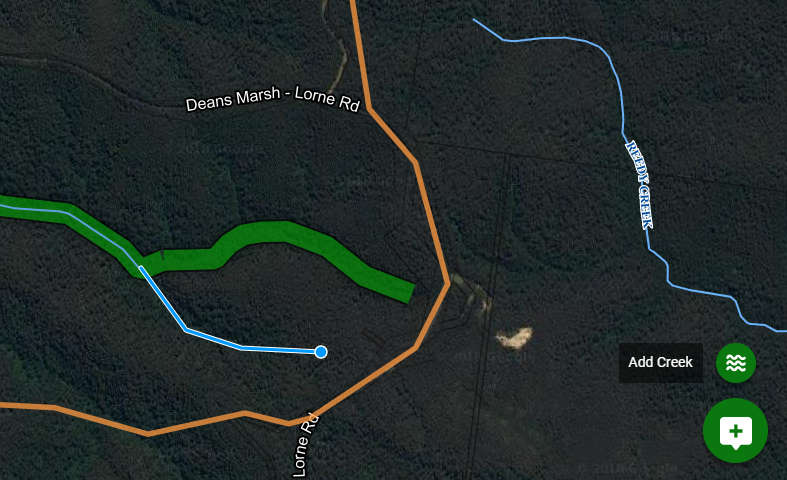 You have the option to change the Landcare Group Name in the details box, as well as change the boundary alignment. Note that DELETE will delete the entire boundary, so be careful! If you cannot see any layers under the Editable Layers group then you may not be successfully logged in. Try logging out and logging in again. If the page freezes or appears to not be responding to input, try refreshing the page by pressing F5, and then logging out and logging in again.